We normally expect to see about 70 service users per homeless drop-in session in July and August. On Wednesday 19 July there were suddenly 96! This is because a neighbouring homeless drop-in was unexpectedly closed, just for one day. Our staff and volunteers coped valiantly with the extra numbers. Particular congratulations to the cooks, who managed to produce a good meal for all 96 of them. 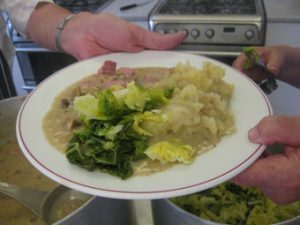 The photo shows a meal similar to what was provided.